The debris filled channel shown at the centre of this image is a tyloses filled vessel. Tyloses are outgrowths that help the living tree to manage stresses associated with drought or infection, and are only found in the wood of four native Irish trees- Ash, Elder, Elm and Oak. in this image the transition from large tyloses filled early wood vessels (image top) to smaller radially aligned vessels in the latewood (right side of sample) can be seen. This is consistent with Oak wood. A small sample of wood was collected from spade 284.1967. the location of which is shown in the 3D model above. A small amount of the sample was cut into thin slices known as 'sections', and mounted for examination using a scanning electron microscope (SEM). 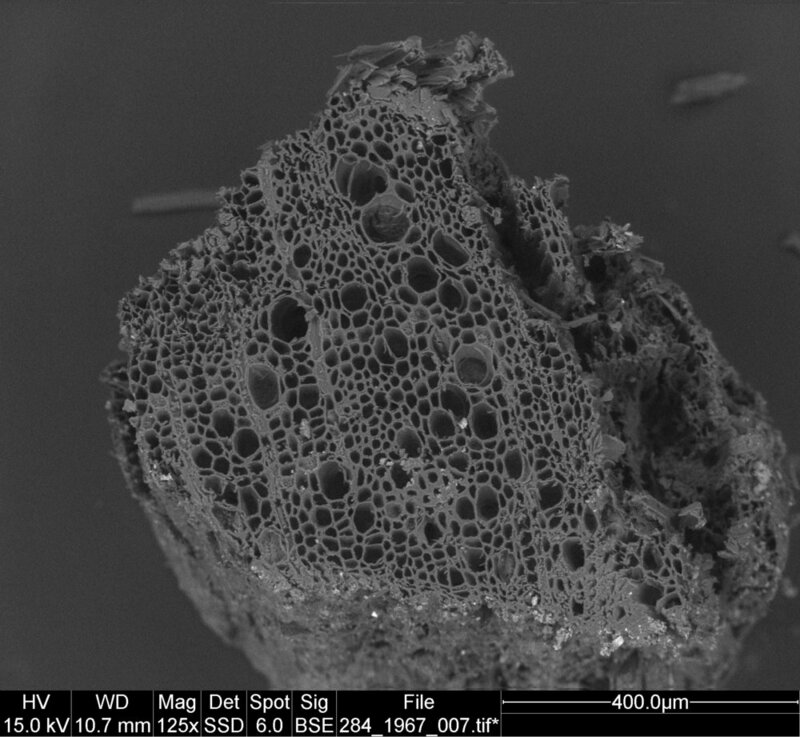 The scanning electron microscope can resolve microscopic features in the wood that help to identify the particular species of tree that the spade was made from. 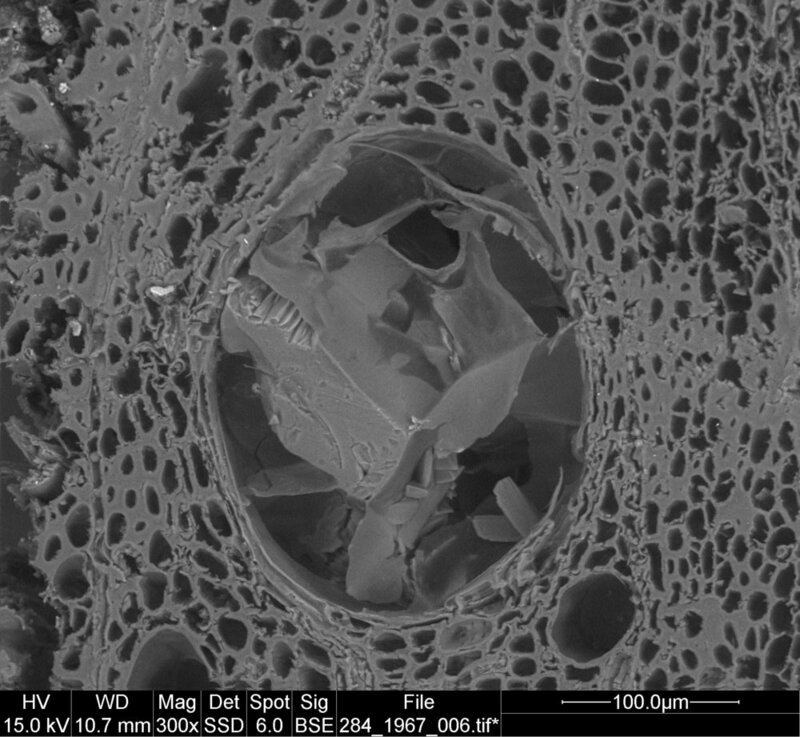 The features described in the series of SEM images above indicate that the spade is most likely made from Oak- (Quercus robur). The sample of wood collected from spade 284.1967 was analysed using Fourier Transform Infrared Spectroscopy (FTIR). The spectral analysis above compares the sample from spade 284.1967 with a reference sample for European Birch wood (Betula pendula). As the predominant component of plant fibres is cellulose, and other major constituents (hemicelluloses and pectins) are also polysaccharides, the FTIR spectra of different cellulosic plant materials are superficially similar and cannot be readily distinguished by eye. In addition, degradation of one or more components of the plant material e.g. through oxidation of the cellulose molecule, will influence the position and intensity of spectral peaks relative to non-deteriorated reference spectra. While there are some minor variations between the spectra, the spectrum for 284.1967 corresponds with that of woody cellulosic material. There is no indication that the wood contains post-collection contaminants.